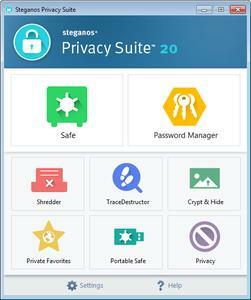 Steganos Privacy Suite 20 combines the award winning Steganos Security software products Steganos Safe and Steganos Password Manager with added features that are only available in the Privacy Suite. Users are able to encrypt sensitive data like business reports, TAN lists or holiday photos thanks to a clear and easy menu navigation - on PCs, in networks and in the cloud. Encrypt your private data. Steganos Safe is a standalone module of Steganos Security Suite, designed for users who want or need strong data encryption for their laptops and PCs. Steganos Safe is an intuitive piece of kit that you can use to create safes on your computer, in order to protect sensitive data from pry eyes. It particularly comes in handy if you share the machine with other people. Steganos Privacy Suite 19 combines the award winning Steganos Security software products Steganos Safe and Steganos Password Manager with added features that are only available in the Privacy Suite. Users are able to encrypt sensitive data like business reports, TAN lists or holiday photos thanks to a clear and easy menu navigation - on the PC, in networks and in the cloud. Steganos Privacy Suite 18 combines the award winning Steganos Security software products Steganos Safe and Steganos Password Manager with added features that are only available in the Privacy Suite. Users are able to encrypt sensitive data like business reports, TANl ists or holiday photos thanks to a clear and easy menu navigation - on the PC, in networks and in the cloud. Passwords for all online accounts can be created automatically and are easily managed and administrated, regardless if it is on a computer, smartphone or tablet. With only one click you are able to delete all browser data and histories. And additionally you can now block tracking and advertising before information on you is stored, and increase your privacy with an anonymized browser.